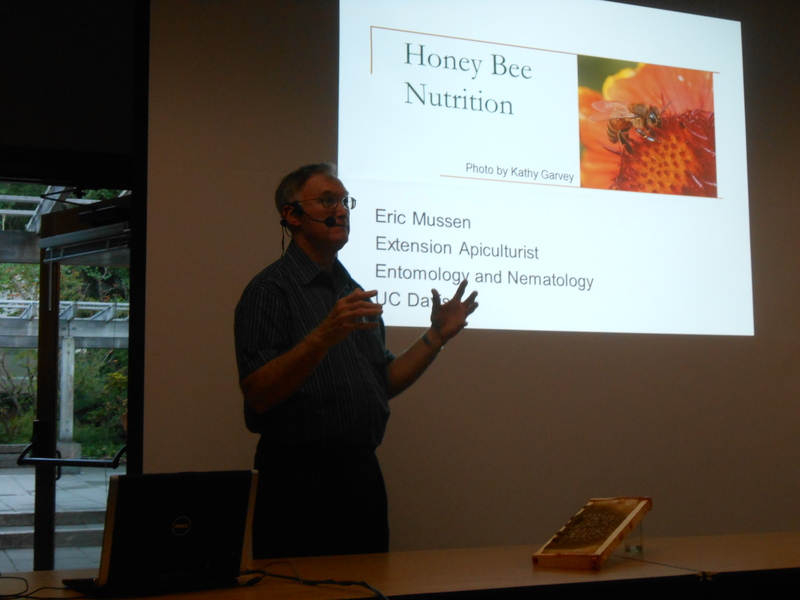 Eric Mussen, the recently retired, extension apiculturist at UC-Davis spoke at yesterday’s meeting of the Puget Sound Beekeepers Association. While his focus was on honey bee nutrition, Mussen stunned the group by opening with the results of his varroa mite study. Mussen explained he and his colleagues had been monitoring several colonies in California, recording the number of mites to fall through the hive in a given week. For the majority of the summer that tally stayed around one to two mites per day, but near the end of the season, Mussen said the mite number exploded to 1,700 in one week. He said these were perfectly healthy colonies throughout the summer, but with the dearth of pollen as winter approached, the bees began robbing honey from other mite-infested colonies. To avoid robbing, beekeepers tend to feed their bees sugar syrup or high fructose corn syrup when they over-winter. Mussen stressed “it’s important to keep the syrup fresh if you can do it.” He cited a recent experiment that left a five-gallon bucket of sugar syrup (sucrose) in a room for one year, during which time it turned into hydroxymethylfurfural (HMF) – a poisonous substance for honey bees. Mussen said over time the sucrose broke down into glucose and fructose, and eventually the glucose also turned to fructose. Over enough time the fructose transformed into HMF. A more acidic sucrose solution and warmer conditions, caused a quicker chemical reaction that produced HMF. According to Mussen, honey bees consume 50 lbs. of pollen and 100 lbs. of honey in one year. “That’s just to keep them alive,” he added. Sugar syrup and high fructose corn syrup aren’t perfect substitutes for honey, but Mussen discussed one experiment in particular that demonstrated the benefits of corn syrup over sugar syrup. Taking 20 new packages, Mussen and his colleagues fed HFCS to some of the bees and sugar to the rest. In the end, the bees fed HFCS drew more comb, raised more brood and the experiment concluded they were “unable to find a negative consequence for feeding bees high fructose corn syrup,” Mussen said. The experiment also tested whether added antibiotics and probiotics were beneficial for the bees. In the end, adding the probiotics, Mussen said, probably made no difference.